Juventus recorded their 11th consecutive league win after Paulo Dybala scored the only goal against a Roma side who showed issues both with and without the ball. The excellent Argentine forward was very much the difference in a somewhat ‘tight’ game which amounted to just 0.8 expected goals combined from both sides. 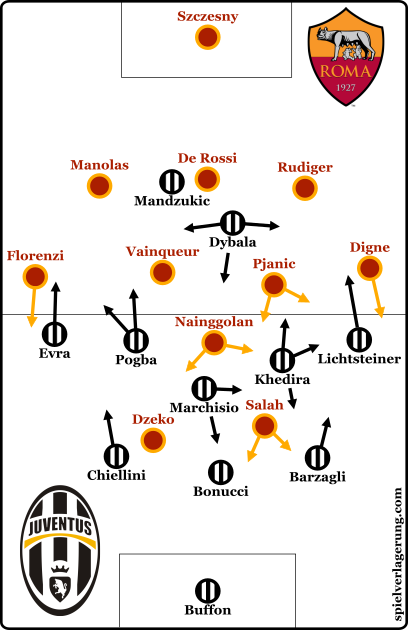 Of this figure, just 0.2 came from a static Roma attack which showed evident collective problems against Juventus’ man-oriented defence. Despite creating just 0.6 expected goals over the course of the game, Juventus were relatively strong in possession and in particular showed good spacing across the midfield. Whilst Claudio Marchisio sat clearly the deepest of the trio as he would support the centre-backs both structurally and in deep ball circulation, Pogba and Khedira ahead moved forward quite frequently. The French midfielder did this most often and also made some movements to the left wing where he would combine well with Evra during attacks down that side. On the opposite flank, Khedira’s movement was often based around supporting the dropping Paulo Dybala. The German could be seen commonly moving to the wing to open space for the forward centrally, whilst in some cases the opposite would happen when Dybala dropped into the right half-space. Overall this created somewhat of a 1-3 shape as the eventual goalscorer would consistently drop to be amongst the midfield trio where he could support with combinations, enhance the spacing and use his technical ability to help progress the ball through the centre of midfield. This was somewhat of a variation to how Juventus’ midfield was structured in the last game I analysed for Spielverlagerung. Against Verona, Khedira would frequently drop to provide extra support to Marchisio, particularly in the build-up stage of possession. This created an asymmetrical shape where Juventus would roughly appear as a 3-4-2-1 with a trio of an advanced Pogba alongside Morata and Dybala forming the attack. However against Roma, Khedira was positioned higher up and with the dropping movements of Dybala, they resembled something closer to a 3-1-5-1 during possession in the middle third. They didn’t have the benefits of asymmetry in possession yet they did have the advantage of a strong spacing across the midfield. Through the midfield spacing themselves well with good distances between Pogba, Dybala and Khedira, they were able to stretch the Roma midfield quite effectively whilst opening the passing lanes into the centre of the pitch. This was especially the case down the right, where Khedira would drag the Roma midfield wide quite well to open gaps in central areas for Dybala to find the ball in. One of the best aspects of Juventus’ possession game is their build-up in defence. Across the defensive line they have technically-strong players who are capable of aiding the development of possession through penetrative passes to provide direct access into the centre. On a collective level they were strong too, with good spacing across the 3-man defensive chain which allowed them to have key spaces within range as well as opening central passing lanes too. Against a passive defence, both Chiellini and Barzagli were invited to move out with the ball in their respective half-spaces and drive towards the midfield line. In doing so, they could often drag out a Roma midfielder to then free up a player such as Pogba or Dybala inside to break the lines of defensive pressure. Whilst in other cases, it would help open up a passing lane to a greater extent or improve the connections to the nearby midfield players. The playmaking abilities of Juventus’ deeper players was really beneficial against Roma’s lack of pressure as they could consistently create overloads in the midfield and open up the spaces with some ease. This loss marked Luciano Spalletti’s 2nd game after being re-appointed as the manager at Roma and his side had some significant problems both with and without possession of the ball. In possession, the side were distinctly static and without any real movement from the midfield or attack. If Pjanic had possession in the midfield, it was very rare to see a player higher up make a movement at all, let alone one which would see him support the Bosnian midfielder. The result of this was that the ball-carrier had little help from his teammates and was without connections around him to help provide stability of possession and give a means of progressing the ball forward. In fact, Dybala’s goal came from a counter-attack after Juventus regained the possession in midfield. In this instance Florenzi had received a pass near the right touchline and without any options further forward, lost the ball in an attempt to dribble directly at Evra. It is almost certain that his decision to make an individually-oriented action of dribbling forward at his man was influenced by the fact that all other attackers ahead of him were standing still and disconnected from the ball. Michael Caley’s expected goals map of the game. Their possession game issues also played near-perfectly into Juventus’ defensive strategy. Allegri’s side employ a man-oriented marking scheme which sees the players occupy their nearby opposition counterpart quite aggressively. They will follow their man to an extent but will not follow the player outside of their zone, which is based upon their positioning within the defensive block. The most common and well-known counter to a man-oriented scheme is to have effective movement off of the ball to disorganise the defensive structure and create spaces to move into. 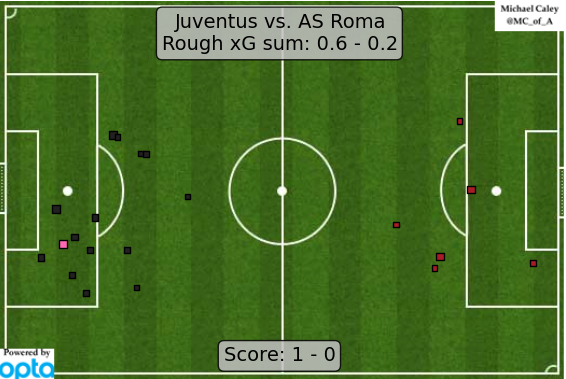 However because Roma were so static in possession, they failed to achieve this and Juventus were very stable throughout the game, limiting their opposition to just 0.2 expected goals. In defence, Spalletti’s side were very passive and would rarely look to put pressure on the Juventus’ ball-carrier in deep position. Passivity is not a problem in all scenarios and teams such as Lucien Favre’s Borussia Mönchengladbach have been quite successful in employing a defensive system which doesn’t look to enforce a high level of pressure on the opposition. However, Gladbach under Favre were so stable due to their high levels of compactness. Supported by their position-oriented zonal marking scheme, they would move within a closed block, exerting a high level of control over the important spaces and then moving efficiently to close out any newly-important areas. They didn’t exert high amounts of pressure on the ball (though Favre did come to develop an intelligent means of doing so), but controlled the space so expertly that the opposition could rarely advance the ball and create with it. Against Juventus, Roma were passive without the ball but didn’t display a sufficient level of compactness which lead to Juventus having not only open gaps to play the ball into, but having the time and space to make this easier due to the lack of pressure on the ball. In some cases, it wasn’t that Roma didn’t look to apply pressure but more that they simply couldn’t establish defensive access, which seemed to be down to a co-ordination error between the players. This was especially so within the half-spaces during Juventus’ build-up as the nearby players didn’t seem to understand how to position themselves accordingly to then effectively press the ball. After a disappointing start to the campaign, Juventus are more-than back on track as they recorded an impressive 11th-straight league win. Although the game was tighter than what we have seen in their recent match-ups, they showed a superiority over Roma throughout the 90 minutes, with an evident control which minimised any threat from the opposition. With Inter Milan, a team who had been getting results unsustainably at the top of the table, now dropping points we are left with two clear challengers for the title with Napoli and Juventus proving two strong sides in Italy this year. Thanks for the analysis. What do you call a ‘1-3 shape’? The 1-3 shape references the midfield, with Marchisio playing deeper than Pogba – Dybala – Khedira.